» Win a Free Box of Purex Crystals Dryer Sheets! 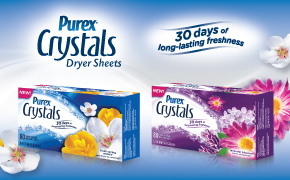 Home » Contest » Win a Free Box of Purex Crystals Dryer Sheets! Win a Free Box of Purex Crystals Dryer Sheets! Purex has kindly provided me with a package of their new Purex Crystals Dryer Sheets to try and coupons to give away to my readers! These have two very strong scents to choose from (Fresh Spring Water and Lavender Blossom) and I have to admit, I love the purple box they sent- it actually sparkles! They are even made to be used as air fresheners around your home! Want to try it for free?? Each winner will receive a coupon for a FREE box of dryer sheets! Enter HERE on my Giveaways page by 5/25 at 9 PM to win! Two winners will be selected using random.org. ← Hannaford and Price Chopper Coupons and Deals!